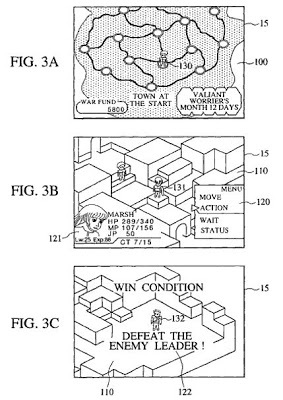 The ‘721 patent describes a video game apparatus which allows a character to move between two predetermined locations. The invention also provides for a rule storage which stores a rule which is set in accordance with updated time units. Each character in the game is given a set of rules wither permitted actions. Whenever a player moves his character in an illegal way, the degree of the violation is determined and a predetermined penalty is imposed in accord with the stored history of violations. A rule (applied to a battle) is set according to a stage of the progress of a game every time the stage of the game advances. When a battle is started, either a player character or an enemy character that can execute an action is determined. When it is decided that the player character can execute the action, a player selects the action of the player character. When the action selected by the player is against a rule, a rule violation is recorded. When the result of the action of the player character is also against a rule, a rule violation is recorded. When the rule violation is recorded, a predetermined penalty is imposed on the player after the battle ends. 1. A video game apparatus, comprising: a movement instruction input section that inputs an instruction to move a player character between predetermined locations to which the player character can move on a map; a movement section that moves the player character between the predetermined locations in accordance with the instruction to move the player character between the predetermined locations; a time lapse section that updates a time unit of a virtual concept in the video game when the player character is moved between the predetermined locations; a rule storage that stores a rule to be set in accordance with the updated time unit; a rule judge that determines, with reference to the stored rule, a rule applicable when the video game advances, and that updates the rule based on the updated time unit; an instruction input device that inputs an instruction to advance the video game; a rule violation determiner that determines whether the determined rule is violated based on the instruction to advance the video game, wherein the rule violation determiner determines the degree of the violation of the rule when the rule violation determiner determines that the determined rule is violated; an item storage that stores items provided to the player as the video game progresses, wherein the item storage stores the items given to the player by classifying the items into groups based on a value; a penalty processor that imposes a predetermined penalty when the determined rule is violated; wherein the penalty processor deletes a predetermined item stored in the item storage to impose the penalty, the deleted item selected from a group in accordance with the degree of the violation of the determined rule; and a violation history storage that stores a history of determined violations, wherein the penalty processor imposes the predetermined penalty based on the stored history of violations.